Without the versatility of a keyboard and mouse, strategy games on consoles have had a rough history. With the exception of the stellar XCOM: Enemy Unknown, even the best attempts feel clunky. Targem Games’ under-the-radar Planets Under Attack doesn’t avoid this fate, but it still manages to be an enjoyable (albeit stressful) experience at times. I found it difficult to explain the concept of Planets Under Attack to onlookers, since I didn’t fully grasp its gameplay until several missions in. Each stage presents an assortment of planets, some stationary and some in orbit. Playing as the human race, you capture neutral and enemy planets, then modify and upgrade them to fit your needs. One type builds your population, another defends against enemy ships, and a third works as a source of income. Balancing these planet types is crucial to success, and getting the hang of how you should be playing takes time. Even on easy, most of the mid-to-late missions are punishing. I found myself restarting dozens of times if I felt I had made even the tiniest mistake in the opening minutes of a stage. Cycling through strategy after strategy can feel like a grind at times, but it can also be rewarding when you discover one that really works for you. At the end of your more successful rounds, you see hundreds and hundreds of your tiny ships swarming an enemy’s last stronghold. Witnessing a victory that dramatic is bound to fill you with a sense of accomplishment. For as fun as the victories are, the means of achieving them can be frustrating. Managing your ship fleets, determining which planets are contributing to attacks, and defending your planets can be a cumbersome ordeal. You are left helpless far too often as you accidentally send stray ships across the map, halting your income. Both locally and online, the game supports skirmishes for up to four players. 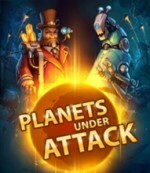 However, you will probably need to convince some friends to download Planets Under Attack if you’re hoping to play online. I tried to connect on numerous occasions after the game was released, and no one appears to be playing it. In its best moments, Planets Under Attack can be a lot of fun. Once I started refining my strategies, I found hours melting away as I attempted to beat various stages on the more difficult settings. Good content and some intense stages can be found in Planets Under Attack, but you have to become accustomed to the quirks in order to get to them. Good content and some intense stages can be found here, but you have to become accustomed to several quirks in order to get to them.